On Thursday, the death toll in Egypt's latest round of conflict climbed to over 500, marking the deadliest series of clashes since the 2011 ouster of longtime ruler Hosni Mubarak. 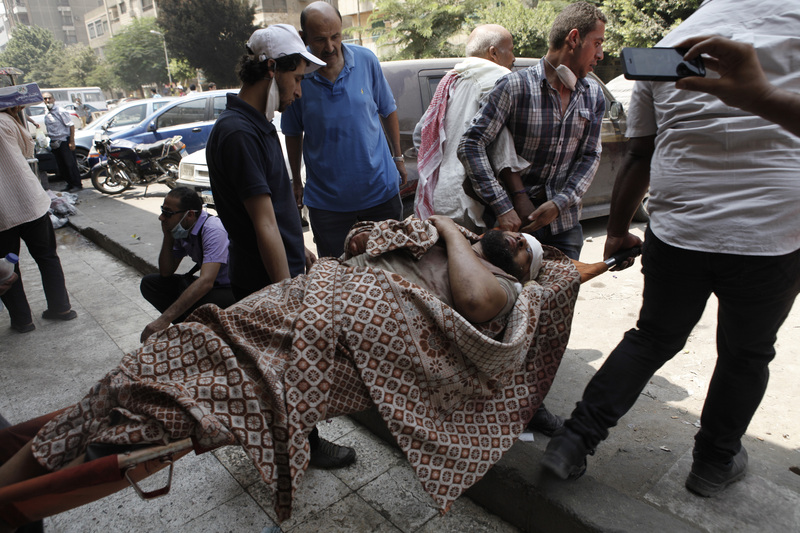 According to the Egyptian Health Ministry, 638 people have died and more than 3,700 have been injured since Egyptian authorities raided protestor settlements in Cairo Wednesday morning. The violent crackdown on pro-Morsi protesters was more harsh than expected. What had been described as a gradually escalating emptying of two encampments turned into 12 hours of violent clashes between state security forces and protestors. By the end of the day, Egypt had declared a one month state of emergency and the country's interim Vice President Mohamed ElBaradei had resigned. The violence continued into the night as protestors continued to clash with police and several Christian churches were attacked or burned. Wednesday's events caused a mixed reaction from countries around the world. Afghanistan, Turkey and France condemned the actions that led to the bloody standoff and called for an end to the killing. Denmark and Norway have temporarily halted their aid to the Egyptian government. Others, including Bahrain and the United Arab Emirates, showed support for the actions of the state government. As for the U.S., White House spokesman Josh Earnest said the eruption of violence was, "directly counter to pledges from the interim government to pursue reconciliation." The White House will reportedly review the $1.5 billion of aid that it provides to Egypt each year, most of which is funneled to the military. Even as many of the dead still lie in mosques waiting for identification, the Muslim Brotherhood called on Morsi supporters to take to the streets on Thursday to continue protesting the removal of their favored leader. "We will push forward until we bring down this military coup,” a Brotherhood spokesman, Gehad El-Haddad, wrote on Twitter.